What about when you want to accentuate the comma. 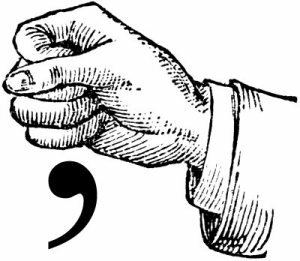 I don’t know whether to use a full stop or a semicolon. This is a sentence I am struggling with. It may be a little grammatically ham-fisted but It’s exactly how I wish it to be. I, if it was me, I would ride it like the wind. There are significant pauses between “I” and “if” then the same significant pause between “me” and “I”, as if they’re being read aloud. Mild pregnant pauses. There is a music term, A fermata [ferˈmaːta] (also known as a hold, pause, colloquially a birdseye or cyclops eye, or as a grand pause when placed on a note or a rest) is a symbol of musical notation indicating that the note should be prolonged beyond the normal duration its note value would indicate. I also want to write “if it were me” but I’ve been told that is incorrect. If you want to accentuate the pauses in your sentence, I would use a dash instead of the commas, indicating a stricter, if not longer, pause between the words joined by the dash. However, I would make the sentence shorter, more direct and grammatically correct, by rewriting it to: If it were me, I would ride it like the wind. “If” takes the subjunctive “were,” definitely correct (although proper use of the subjunctive is a dying art). Hope that helps, and thanks for writing!